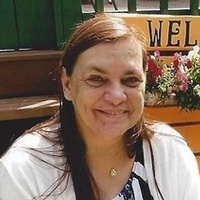 Veronica M Warrington, 60, of Queensbury, passed away Sunday, July 1, 2018. GLENS FALLS NY — Veronica M Warrington, also known as ‘Rony’, 60, of Queensbury, NY, passed away Sunday, July 1, 2018, with loved ones by her side after a long illness battling kidney disease. Born July 29, 1957 she was the daughter of George and Joan (Burch) Morehouse. Veronica was employed by Angio Dynamics and Native Textiles and also enjoyed making quilts for loved ones and friends. In 1975, Veronica and Sanford Warrington were married at the Sodom Community Church in North Creek, NY. In addition to her parents, Veronica was predeceased by George “Papa” Morehouse and Joan Burch; mother-in-law, Barbara Warrington; and numerous aunts, uncles and nephews. Those left to cherish Veronica M Warrington’s memory are her husband, Sanford Warrington; children, Dawn Jackson (Winston), Sandra Craig (Jeff), Darcy Warrington (Levi), Connie Stark (Chadd), as well as Shawn Warrington (Penny). Rony had grandchildren; Cody Warrington, Dylan Warrington, Kimmi “Rose bud” Craig, Aarron Craig, Timothy “TJ” Warrington, Kristin Carpenter, Trevor “Trey” Warrington, in addition to Kali-Ann Warrington and Chadd Stark Jr. She had great-grandchildren; Neveah Myers and Jaxon Cabrera. Rony’s surviving sisters are Brenda Monroe, JoAnn Dunphy, Becky Bunzy, as well as Joyce Denno. Her aunts and uncles are Myrna Oatman, Pete Burch, and Carol Gaulusha. Rony had nieces, nephews, and cousins. Theresa Cahill, Bambi Monroe, Rhonda Monroe, in addition to Kerri McFarlane. She had countless great nieces and nephews, family and friends. The family extends a sincere thank you to The Glens Falls Hospital and The Broad St. Renal Center.